Today it's hard to spot the dividing line between Poole and Bournemouth, apart perhaps from spotting the street where the recycling bins change colour. But what looks like one big sprawling south coast conurbation is in fact two very separate towns, with Bournemouth the Victorian upstart and Poole the ancient settlement. Once one of the most important ports in Britain, Poole is best known for its enormous natural harbour - only Sydney's is larger in size. If it's sun and sand and sea you want, then Bournemouth every time, but for anything involving heading out onto the water, Poole is where it's at. What you don't want to do, as a tourist in Poole, is hang around anywhere near the railway station. Much of the town was upgraded between the 1950s and the 1980s, with older buildings wiped away to make way for new civic buildings, shopping centres and flyovers. It may be functional but it's not pretty, with Falkland Square a particularly bleak point of access to the Dolphin Mall, and hence the ideal location for tedious referendum campaigners to harangue the local populace. The High Street is mostly pedestrianised, and runs down to the harbour across a level crossing. It's a fairly ordinary shopping street, given that all the big chains are in the Dolphin, and features a wealth of minor independent stores selling ironmongery, fresh baked lardy cakes, fancy dress and more. At the foot of the street, where it gets historically narrow, sits Poole Museum. 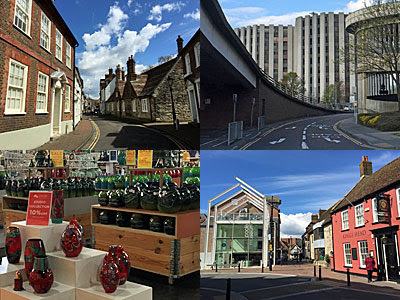 It's made up of three separate buildings, the Town Cellars, a 19th century grain warehouse and a very 21st century extension (which perches on the front). It also spreads across four floors, from the preserved logboat at street level to a collection of local ceramics up top, with intermediate floors focusing on the town's maritime past and life as it is lived. A decent package well presented, I'd say. But I'd query the positioning of the museum cafe on the 3rd floor, even if this means it gets a nice roof terrace overlooking the street, because there was zero evidence that any of the population of Poole can be bothered to hike up that far. Rest assured there is an Old Town, a few acres of deliberately undemolished twisty streets surrounding the old parish church. 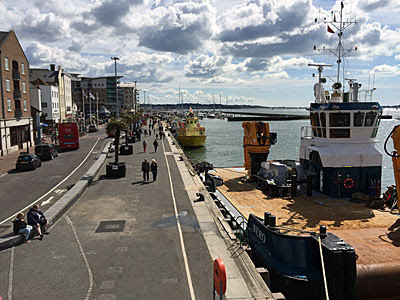 But the main tourist drag in Poole involves the quayside overlooking the harbour, and a road specifically called The Quay. Once this would have been alive with port traffic, indeed the last time I was here, circa 1970, I think it was. Back then the Custom House oversaw the administrative side of maritime trade, whereas now it's a bar and restaurant, such is progress. Further along are pubs and a chippy, though not an amusement arcade, Poole's a bit too classy for that. Folk who sail motor yachts into its marina prefer finer dining and the chance to buy an apartment in the very modern silvery block than dominates the skyline from the harbour. Alongside is a cavernous building that's home to Poole Pottery, a renowned Victorian company that's slipped in and out of administration of late. As well as a studio area where actual design work is carried out, the shelves are filled with hundreds of colourful ceramics, both firsts and cut-price seconds, and the air is thick with the whiff of gift candles. Unfortunately for the company's coffers I much prefer PP's older stuff, arrayed in a couple of cabinets at the back labelled Collectors Corner and far too valuable to be sold. The old lifeboat station at the far end of the marina is only small but contains a free museum (and maybe a man outside flogging plaice). The RNLI has a considerably greater presence round the back of Asda, nearer the station, where you'll find the national Head Office and Training Centre. But the top attraction hereabouts would appear to be the opportunity to go out on a boat around the harbour. Three companies compete for your custom from three different coloured huts, at least two of which turn out to be in cahoots, so the ticket you buy from yellow might mean a ride on orange, and vice versa. Boats run half hourly to Brownsea Island and back... which obviously is what I did next, and I'll tell you more later.